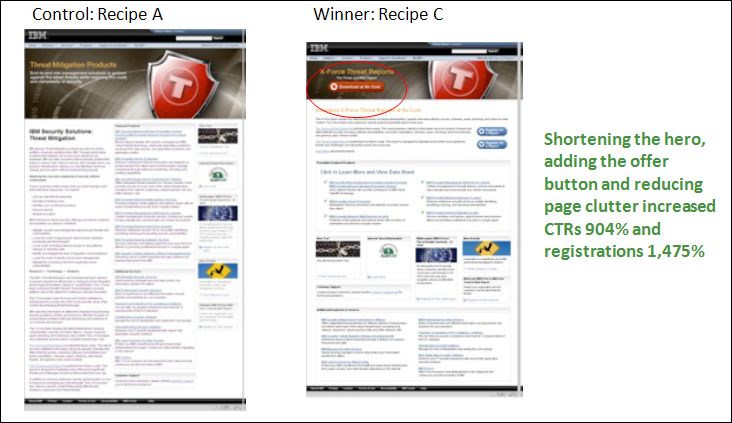 At the West Coast leg of the MarketingSherpa B2B Summit 2011 in San Francisco this week the first case study of the day featured IBM’s homepage redesign and the overall approach IBM uses in its redesign process. Joan Renner, Content Manager, Corporate Marketing Digital Initiatives, IBM, presented on how Big Blue engages in site redesign. But they don’t stop at the landing page. They go the next step into the funnel and test landing pages, as well. In this case a test was created to improve the landing page for the IBM X-Force Internet security and threat report landing page and led to a dramatic improvement in the page’s performance. The objective was to test the layout of content and the addition of call-to-action button to increase the clickthrough rate to a report download and links to products and services. The test ran for six weeks featuring a control and two treatments and involved 100% of visitors to the X-Force landing page. The key difference between the control and treatment is a shortened hero image at the top of the page, the addition of a call-to-action button for the report download and a dramatic reduction in page clutter. Overall results of the tested changes was a 904% increase in clickthrough rate, and a 1,475% increase in registrations, both at 99% confidence. IBM’s learnings may (or may not) work for your landing pages. There’s only one way to tell … let’s get testing. David is a reporter for MarketingSherpa (our sister company) and has over twenty years of experience in business journalism, marketing and corporate communications. His published work includes newspaper, magazine and online journalism; website content; full-length ghosted nonfiction; marketing content; and short fiction. He served as producer for the business research horizontal at the original Office.com, regularly reporting on the world of marketing; covered a beat for D/FW TechBiz, a member of the American City Business Journals family; and he provided daily reporting for multiple LocalBusiness.com cities. David’s other media and corporate clients include: USA Today, Oxford Intelligence, GMAC, AOL, Business Development Outlook and C-Level Media, among many others. I feel like this should have been beyond obvious… I’ve advocated this to numerous people for years now. Even stranger is that it seems to have been an industry trend for the last couple years. Why is IBM just now looking into it? Wow, the results (904% increase in click-through; 1,475% increase in registrations) are pretty dramatic! Question: how does the landing page redesign increase click-through? Seems like influencing click-through is up-stream of the landing page (i.e., a redesign of the ppc ad or email, etc., would increase click-throughs to the landing page, and then landing page optimization increases conversion rate). Unless it is increasing traffic by virtue of better SEO. 1. Reduce the amount of copy/images/clutter on the page even more dramatically. Even the optimized page is very dense and I can’t imagine all this content is needed to convince a person to download a free report. It would be great if the blogmaster could attach larger images of the pages, even the zoomed-in version attached is too small to see any of the copy/graphics to get a real idea of what’s going on here. But the content of the landing page should be single-mindedly focused on getting people to download the report (thus creating a lead). This looks more like a microsite (with many links and CTAs) than a landing page. 2. Eliminate the top navigation from the landing page, and all other hyperlinks except the “download” button. Any links that can take people away from the page should be eliminated. Eliminating top navigation is something many webmasters will view as heresy. But direct response marketers know that the only click-able item on a landing page should be the “download” button. Your landing page should function like a cattle chute, giving your page visitors only one navigation option. Sounds like this was an ABC test so it’s difficult to know which changes should get credit for the improvement. You don’t know if one of the changes was responsible for all the improvement or none of the improvement or actually decreased the total possible improvement. Why didn’t they opt for multi-variate testing so they could see which individual changes actually make a difference and by how much? Bob H., in the article is says CTR is “to a report download and links to products and services.” It sounds like CRT is click on the Call-to-Action on the page. I assume the registration is on the next page. Like Bob, I’m curious to know if they tested any version with even less information on the page. It appears that cutting even more information might further improve the CTR.